For the extraordinary international success of Speaker’s & Mental Business Designer® Christoph Ulrich Mayer, an extraordinary team of highly committed people, who work with him and for him to ensure that every lecture and seminar becomes an unforgettable highlight event.wird. Kerstin Wollmann is our Customer & Business Project Manager and is responsible for the sales of all seminar & mentoring activities. This means: structuring, coordinating, organizing – and communicating clearly with the team members and our clients. With her practical experience as a sales & education expert in her fresh and cheerful manner, Kerstin Wollmann is the perfect partner for us! The contact persons for all enquiries concerning press and media issues. As press and media experts, they coordinate Christoph Ulrich Mayer’s press and media work and carefully coordinate the content of media coverage. 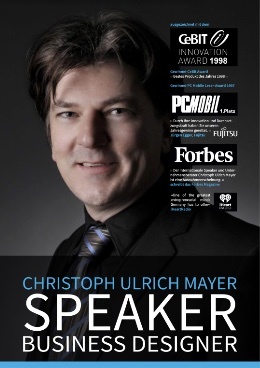 They also develop press & media, marketing and communication concepts for Christoph Ulrich Mayer’s clients. The economic hardfacts reflect Elisabeth Kugelmann’s responsibility. Their profession is to organize & supervise accounting, financial accounting and financial controlling. She supports the management in all matters concerning corporate finance and is a competent contact for customers and service providers in invoice management. A perfect technical infrastructure is an important component of success: Matthias Hatzak is responsible for this area. It ensures that everything runs smoothly, the website, the networks and servers run faultlessly and that all data can be retrieved at any time. Eliane Mietke completes the team in all aspects of creativity, graphics and design. Many of Christoph Ulrich Mayer’s customers already benefit from the know-how of these two experts in their field. Matthias Hatzak is responsible for this area. It ensures that everything runs smoothly, the website, the networks and servers run faultlessly and that all data can be retrieved at any time. Eliane Mietke completes the team in all aspects of creativity, graphics and design. Many of Christoph Ulrich Mayer’s customers already benefit from the know-how of these two experts in their field.